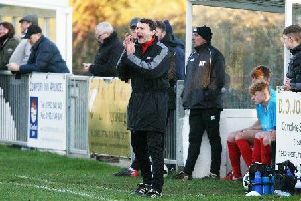 Worthing’s successful side of the 1980s will be reunited at the club’s clash with Harlow Town on Saturday. A number of the squad that took the Woodside Road outfit to the second round of the FA Cup in 1982 will come together again this weekend. Several members from those days are regulars at Worthing and they will be present as Adam Hinshelwood’s men host Harlow in the Bostik League Premier Division. Geoff Raynsford, who featured for the club in the 80s, said: “We have arranged this reunion as the bond between us all is so great, we will never lose it. It is over 35 years since we first started playing together at Worthing and they were without doubt the best footballing years of our lives.